Replacement: None. We are no longer carrying this PdBreakout in our catalog. This page is for reeference only. Don't think you can solder the tight pitch of the iPod connector? This is the breakout board for you. 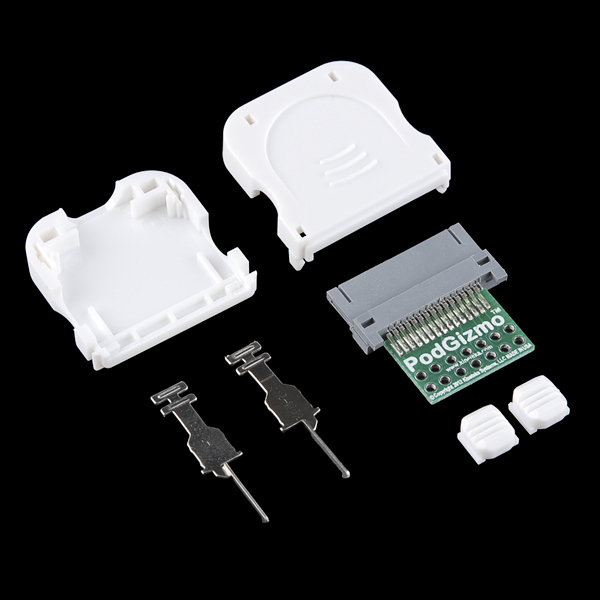 The PodBreakout Mini brings the most commonly used pins of the iPod connector out to through-hole pins. The board fits inside the connectors shell housing for a nice clean-looking hack. 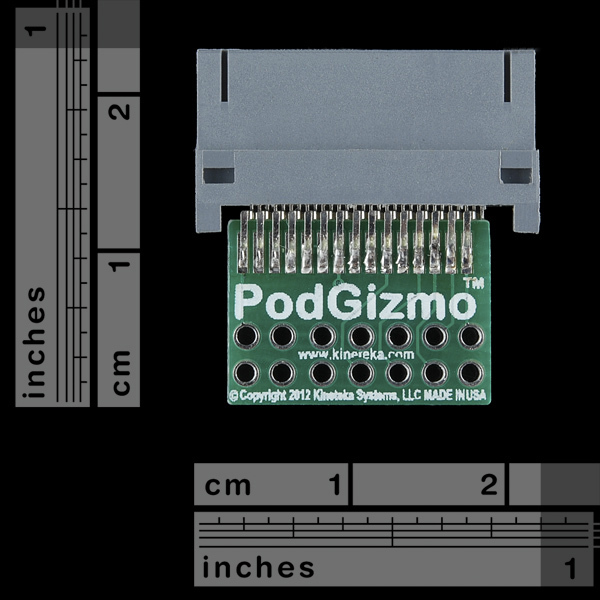 This board breaks out the most common pins (1, 3, 4, 5, 6, 8, 13, 12, 21, 23, 25, 27 and 30) of the iPod connector. If you need access to all 30 pins, check below for the full-sized PodBreakout. Are there any plans to make a female version of this breakout? Either in mini or full size? Please? The description lists 13 pins that are broken out, and the photos on the manufacturer's site show a board with 13 pads. However, the photos here clearly show 14 pads. What is the 14th pin, and are the pads actually labeled on this variant? Breaking out pins 3 and 4, but not 11, is kind of odd, since you need to ground pin 11 to use 3 and 4. You've got to solder something directly to the pin left of 13. Easier than soldering directly to pins 1,3,4, and 11 (without shorting anything), but odd nonetheless. Checkout what Reed Ghazala did with one of these. Hey, I have successfully used the larger verson to interface with an iPod, but this smaller one does not break out pin 11, the Serial GND. In that case, is the Serial ground connected internally to GND somewhere via some other pin? It makes sense, as the board breaks out Serial lines, indicating the use of Serial comms. Basically, has anyone used this to succesfully communicate via Serial?